Whew! She made it just in time! When I finished Queen Abigail the Wise, I left myself a big opening to make it into a series. You never know what’ll happen in life, but I found that I really liked my five main characters — the young ladies of the Club, so to speak — and wanted to see them again. I also liked the way that thinking through their problems helped me reconsider aspects of adult life and the Christian life. So I was really most gratified when my muse (or whoever it is that I’ve got living upstairs in the attic) actually did get moving, and Vanessa the Wonder-worker is the result. If you’ve never read Queen Abigail the Wise before — or have but want to re-read — the action in the book takes place starting on the first Sunday in Lent and ending with Pascha. If you want to go through Lent with my read-along posts, HERE is the list of all of them. 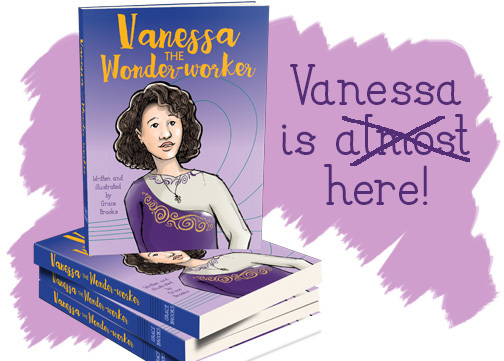 Vanessa the Wonder-worker picks up roughly a year after the end of the last book, with the same girls, Club, church … everything. The action spreads across the weeks of the Pascha season, ending with Ascension Day. So if you want to read through the new book with me, I’ll begin on Sunday, and we’ll go through the first 70 pages throughout the week. Hope you can all join me — I had a lot of fun with this last year!